Main functions, some of which may be overridden by subclasses. Initialize this event handler and all related objects needed to generate events. Continue generating an event if the generation has been stopped before finishing. Clear all step handlers, making the handler ready for a new event. Returns true if there are no step handlers left to apply to the current event;. Write out accumulated statistics about intergrated cross sections and stuff. Return the maximum number attemts allowed to select a sub-process for each event. Access to the luminosity function. The kinematical cuts to used by subclasses which do not provide their own. A PartonExtractor object to be used by sub classes which do not provide their own. Return a pointer (possibly null) to the assigned main CascadeHandler. Return a pointer (possibly null) to the assigned main CascadeHandler to be used as CKKW-reweighter. Return true if this event handler should produce weightes events. Determines how often the event handler should check for charge and energy-momentum conservation. The maximum fraction of the total invariant mass of a collision that any of the components of the summed momentum is allowed to change during the generation. Perform a given step using a handler and a hint. In the curresnt list of step handlers to go through, add another step handler and/or hint. Initialize the groups of step handlers. Throw away the current event/collision. Throw away the last generated event before generating a new one. Setup the step handler groups. Access the step handler groups. Utility object to facilitate default selection of step handlers. Emit warning that this EventHandler is incomplete. The maximum number of attempts to select a sub-process allowed per event. True if this event handler should produce weightes events. Controlls the amount of statistics written out after each run to the EventGenerators .out file. Pointer to a luminosity function tobe used by subclasses. The EventHandler is the base class used to implement event handlers in ThePEG. Objects of this class is assigned to an EventGenerator object which supervises a run. This base class is not able to generate complete events, although it does have a virtual generateEvent(). If the EventGenerator to which an EventGenerator is assinged is asked to generate a full event, it will call the generateEvent() function which will write an error message and abort the run. Objects of this base class can, however, be used to administer the evolution of a partially generated event supplied from the outside. To specify this event evolution the EventHandler maintains five groups of so-called StepHandlers implemented as HandlerGroups. Each group have a main step handler: SubProcessHandler, CascadeHandler, MultipleInteractionHandler, HadronizationHandler and DecayHandler respectively, whereof the first group only uses the post-handler part of the group. The EventHandler class inherits from the LastXCombInfo class to have easy interface to the information in the last selected XComb which carries information about the hard sub-process in the event. If a sub-class implements the generation of sub-processes and thus becomes a full event handler it should implement the generateEvent() function appropriately. It should also set the flag warnIncomplete to false, to avoid warnings when initialized as the main EventHandler of an Eventgenerator. The interfaces defined for EventHandler. Definition at line 63 of file EventHandler.h. Definition at line 77 of file EventHandler.h. Enumerate the different levels of consistency checking. Do not perform consistency checks. Definition at line 68 of file EventHandler.h. Check that the charge and energy-momentum in the last step of the current collision is consistent with the incoming particles. If not, a warning will be generated. Reimplemented in ThePEG::StandardEventHandler, and ThePEG::LesHouchesEventHandler. Continue the generation of a Collision. Used if the generation was previously interrupted. Called in the run phase just after a run has ended. Used eg. to write out statistics. Definition at line 416 of file EventHandler.h. References clean(), ThePEG::InterfacedBase::dofinish(), getReferences(), and rebind(). This base class is not capable of generating complete events and calling this function will result in an exception. Sub-classes which are capable of generating complete events from scratch must override this function. Generate an Event, where the initial state is supplied from the outside. a pointer to the generated Event. Generate an Event, where the initial state is supplied as a single step from the outside. A histogram bin which has been filled with the weights associated with the Event objects should be scaled by this factor to give the correct cross section. This version of the function will produce an error message. It is up to a sub-class able to generate full events to return the correct value. The pair of incoming particle types. These are null if not set by a subclass. Definition at line 206 of file EventHandler.h. The total integrated cross section of the processes generated in this run. This version of the function will produce an error message. It is up to a sub-class able to generate full events to return the correct value. 0 if no integrated cross section could be estimated. The estimated error in the total integrated cross section of the processes generated in this run. 0 if no integrated cross section error could be estimated. 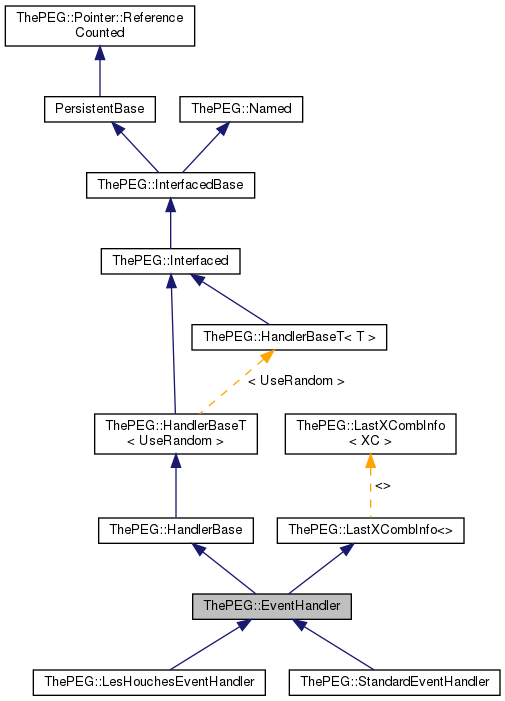 Reimplemented in ThePEG::LesHouchesEventHandler, and ThePEG::StandardEventHandler. Create a new step and make it current. A StepHandler should be supplied which will be set as the handler for the created Step. Definition at line 308 of file EventHandler.h. Definition at line 271 of file EventHandler.h. Definition at line 666 of file EventHandler.h. Should be set by a subclass which implements a complete EventHandler. Definition at line 615 of file EventHandler.h.